According to EN 81-80 table B2 no.47 traction sheaves, rope pulleys and chain wheels have to be retrofitted with a finger protection device according to EN 294 table 4. Technical report from Georg Wallraff, for the first time published in the "Lift-Report 1/2007"
The professional implementation of this requirement reaches the limit of what is feasible. 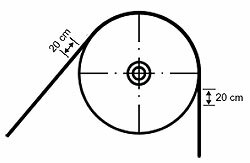 So table 4 postulates safety distances towards the finger entering points, which can only be realised by a complete enclosure of the respective pulley. The initial attempts of different lift companies to fulfil this task by means of solid hoods encountered the strong resistance of many experts, because through these hoods the rope groove cannot be seen and the regular driving gear check can only be carried out with great effort. The company W&W has concentrated on this topic and has discussed it with many experts from lift companies, the Technical Inspection Agency and the DEKRA, searching for system solutions. The balance should provide an adequate level of safety for the particular risk." „1. when bringing the product into circulation a.) ensure that the user receives the necessary information to enable him to assess and safeguard (e.g. warning label) against the dangers which may emanate from the consumer product during the usual or reasonably foreseeable period of use and which are not immediately evident without corresponding instructions. Meanwhile two protection variants have been established in the market, firstly the partial covering by means of an aluminium cage, and secondly the limited covering of the two rope entering points. a) the entering points should be covered safely to inhibit accidental grabbing in from below. The company specifies a distance of 20cm in the instructions of their cages as an internal norm. 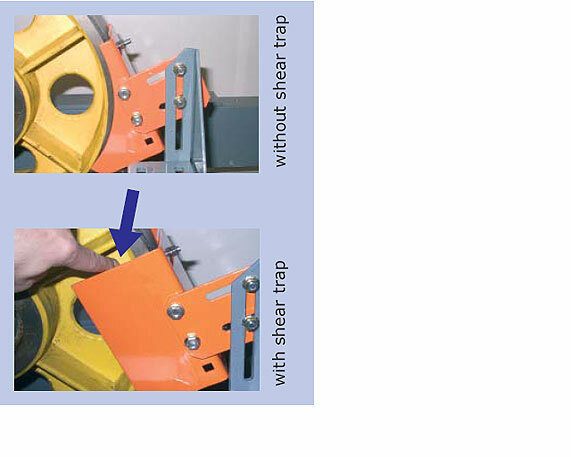 b) shear traps should be avoided if possible. 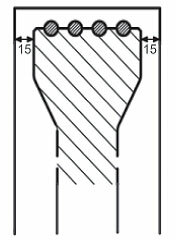 When using finger protection devices it is recommendable to implement covers with curved cheeks, in order to avoid creating a new shear trap at the stiffening ribs of the traction sheave. It is also recommendable to colour the covers in signal orange, as it is possible that there are finger crushing points in the upper, exterior section of the plate as well, depending on the rope diameter and distance. 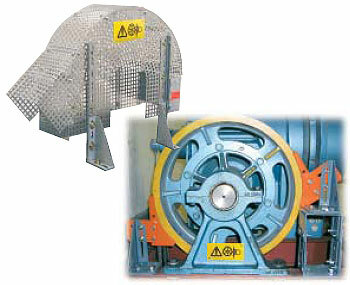 In case of aluminium cage covers a sufficient distance to the traction sheave should be kept to avoid sharp shearing points. W&W indicates a minimum distance of 15mm. c) other shearing points, e.g. between the hand wheel and the aluminium cage also should be avoided in any case. For this reason the company from Düsseldorf developed a cover system with 132 different semicircular cage variants. d) at each traction sheave, rope pulley and chain wheel cover a warning label according to DIN 4844- 1 should imperatively be affixed to inform the instructed persons about the residual risk. Instead of multilingual warning advices we recommend the use of a pictogram. e) the assembler ought to receive a detailed instruction with safety advices to be able to mount the devices professionally. In spite of all safety measures it is possible that accidents happen at pulleys with finger protection devices in case of misconduct or incorrect mounting. Also, insurances like to look for who is to blame in case of bodily injuries. When constructing and choosing the protection device or when charging a local locksmith, the responsible lift company should take this into consideration.